About a hundred years ago a little boy was born whose name was Nevil. He lived at a place called Ealing* at a time when aeroplanes were just beginning to fly properly. The house he lived in was exactly between Hendon and Brooklands, two of the earliest airfields, and so he saw all sorts of aeroplanes fly over. Yes they did call them aeroplanes in those days though we say aircraft today. I don't know why. Our friend Nevil Norway had a bit of a stutter. You know what I mean; he sometimes had to say the first part of a word two or three times before the rest of the word would come out. If you asked him his name he might find himself saying Ne-Ne-Nevil Nor-Nor-Norway. So when he started school he found that some naughty children would make fun of him. Even worse than that some of the teachers showed him up in class by making jokes about it. Nevil got so fed up with this that one day he decided not to go to school at all. What did he do? He rode backwards and forwards all day on the train that used to take him from Ealing to a place called Hammersmith where the school was. He was able to do this because he had a rail pass and in those days the trains were so full of people that no-one noticed this little boy on the train all day. Two days later he did it again. He must have seen someone show a rail pass and pay some money. He found that by paying one penny extra he could go four stations further down the line. That day he got out at a place called South Kensington. Here was the big Science Museum. In those days all museums were free and so in he went. What a wonderland he found! There were models in glass cases and if you pressed a button they started to work! Stephenson's Rocket, the engine that pulled the first train full of people was there. So were some of the very earliest aeroplanes. He had seen aeroplanes flying in the air but now he could look at them close to. The best of them all was the one that had first flown over the sea from France to England. It was called the Bleriot 11. He wandered around fascinated and tried to see how they all worked. His teachers thought he must be ill but when they did not get a note they sent the school inspector round to his house. So he was found out and had to explain what he had done. His Mum and Dad were very upset but as they weren't very interested in mechanical things they did not really believe that he had spent all his time looking at things in that museum. They did know it would be best to send him to another school and they told the new school what had happened and the teachers there treated him much more kindly. He did quite well after that and went on to college at Oxford. He chose to learn much more about engineering because he wanted to help build aeroplanes. He got a job with a company called De Havilland and he loved doing all the sums that had to be done to work out the shape of the wings. They didn't have computers in those days. They didn't even have pocket calculators. What they DID have were people who worked it all out on pages and pages of paper! What a long time it must have taken them! While Nevil loved his work during the day he wanted something quite different to do at night. So he tried changing from sums to words. He found there was magic in words. He started writing stories. Now I wonder if you have a middle name. He did. His full name was Nevil Shute Norway. He was not at all sure that his boss at work would approve of him writing stories in the evenings so he decided to write under his middle name. He said the books were written by Nevil Shute. Shute had been his Grandmother's name before she was married and she had wanted him to have it. Now he was going to use it in a rather special way. He didn't do very well at first. He wrote two whole books and no-one wanted to print them. He did not give up and his third book went into print. It was called Marazan. By this time he was helping to build airSHIPS. No-one believed that an aeroplane could fly safely across the sea with passengers on board. So these HUGE gas-filled airships were being built. Let me try to explain what they were like. You may have had one of those balloons that you have to hold tightly on a string or it goes right up into the sky. Well, they used that idea but they put enormous balloons like that into a huge cigar-shaped frame. From this they hung engines and propellers to drive it through the air and inside it they had cabins and dining rooms just like on a ship. So you can see how big it must have been. Nevil Shute Norway helped to build one of these ships of the air and it flew from England to Canada and back though it did have a few problems on the way. Another one was built and it tried to fly to India but ran into a terrible rainstorm and crashed and many important people on board were killed. So they stopped making airships. Our Nevil decided that he would set up his own aircraft company. They called it Airspeed and it even built an especially comfortable aeroplane for the King to fly in. This went well. So well that our friend got fed up working there. He liked to be working on difficult things that might or might not work. So he left. War started in 1939 and he joined a group of scientists who were given the job of making secret weapons. They had a very long and difficult name to remember. They were supposed to be called The Department of Miscellaneous Weapons Development but someone gave them the nickname "The Wheezers and Dodgers". They liked that much better and everyone thought they knew what it meant. Nevil Norway (we should call him Commander Norway now as he was an officer in the Royal Navy), Commander Norway worked on flame-throwers and anti-aircraft rockets. One of these had a lot of rockets on a steel frame and it was nicknamed "The Pig Trough" which they thought was funny. They even made a Rocket Spear to sink submarines! The thing that gave them the most fun was a huge pair of wheels made to carry explosives and this was driven by rockets like a giant Catherine Wheel. Nevil nicknamed this Panjandrum, a super name, but too difficult to explain. Commander Norway was even asked to design an invisible boat. Can you believe it? All this time he kept on writing stories in the evenings and when the war finished his books were selling so well that he decided to make writing books his job. Don't think he gave up his love of aeroplanes .... he bought one of his own! When he had got it he wrote to a friend and asked him if he would like to fly to Australia and back. They had to do this in short hops because aeroplanes could not fly very far in those days. They had to keep landing to fill up with petrol. So they landed in France, Greece, Iraq, India, Burma, Malaya, and Bali and then flew all around Australia. Quite an adventure. Perhaps you may like to find these places on the globe in your classroom. Anyway Nevil liked Australia so much that he and his family went to live there. Yes he had found time to get married. His wife was a Doctor and they had two daughters. One was named Shirley and the other was named Heather. Our NeNeNevil liked Australia very much. He took his little aeroplane with him and flew to all sorts of places. If a doctor or a reporter or someone like that wanted to get to a place a long way away he would take them. Then he would sit and listen to what the local people talked about and when he got back he would start writing another book! Several of his books were turned into films. I like No Highway best. It is about an ordinary little man called Mr. Honey who suddenly has to do important things. He even collapses the undercarriage of an aeroplane so that it goes flat on the runway, as he does not think it is safe to fly! There are twenty five of Nevil Shute's books to choose from so you may find you like one of the others about Australia better. All this started just because aeroplanes flew over his home and because of that chance visit to the museum. From this he knew what he wanted to do. He wanted to build aeroplanes. Later he discovered he could write stories as well. Would you like to be remembered in a hundred years from now? 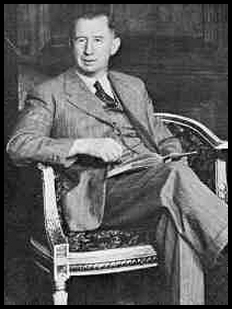 I don't suppose for a minute that Nevil Shute Norway expected to be remembered by so many people. What he did expect was that people would know what they wanted to do .... and get on with it!